Blaby District Dementia Action Alliance (BDDAA) are a group of organisations who have come together with the aim of making Blaby District a better place to live for people with dementia and their carers. Blaby District has an increasing ageing population and it is expected that the number of people living with dementia locally is expected to almost double by 2030. 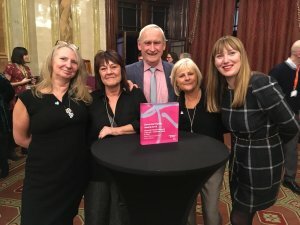 Blaby District Dementia Action Alliance won the converted Dementia Friendly Award 2018 Dementia Friendly Community of the Year - Rural area, Village or Town at the Alzheimer's Society Awards. Are you an individual, own a local business or shop, run a local community group or work in a large organisation? If you are passionate about improving the lives of people affected by dementia we want to hear from you. In return we ask you to commit to at least 1 action and sign up to our local Dementia Action Alliance. We meet 4 times a year, we discuss our actions, measure progress, share best practice and exchange information. New dementia guide launched for people living in Leicester, Leicestershire and Rutland. It is a practical guide to living with dementia and has been co-produced by Leicester, Leicestershire and Rutland DAA and Care Choices. Forget Me Not Memory Café provides information about living with dementia and other services available locally in an informal and comfortable environment. They are also a place to relax, socialise and meet other people with dementia and their carers. 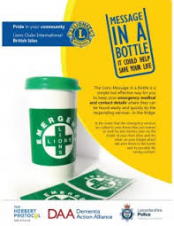 The Lions Message in a Bottle is a simple but effective way for you to keep your emergency medical and contact details where they can be found easily and quickly by the responding services- in the fridge. In the event that the emergency services are called to your home they are trained to look for two stickers (one on the inside of your front door and the other on your fridge) which will alert them to the bottle and its possibly life saving content. If somebody living with dementia goes missing, it's a very stressful situation for everyone concerned. The Herbert Protocol is a national scheme and is available through Leicestershire Police. You can download the form below or pick one up from your local police station. Complete the form with information about the person with dementia and keep it in a safe place. Reading Well books about dementia that you may find useful if you have dementia and or caring for someone with dementia or want to find out more. Visit or contact your local library regarding stock of these books. 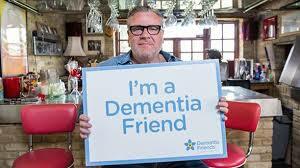 Dementia Connect is Alzheimer's Society's brand new dementia services directory for anyone affected by dementia in England, Wales and Northern Ireland. With over 5,000 listings of local information, support and services, it’s the most comprehensive and easy-to-use online directory of its kind using a simple postcode search.